The Bakwé language is a tonal language with three levels of tone. Words will have one or more of these tones as part of the pronunciation of the word. In other words, saying “’na” with high-tone means something different than “-na” with low-tone (“my” versus “your”). So, you want to be very careful when you introduce your wife, saying “This is ‹my› wife”, or you will say “This is ‹your› wife”! There are three main dialects of Bakwé: dεplε, dεfa, and djama. The largest spoken dialect is dεplε which is made up of two sub-dialects: srüpö-dεplε and nyragbi-dεplε. The srüpö-dεplε dialect was chosen for literature development because it is the dialect that all the others can understand. 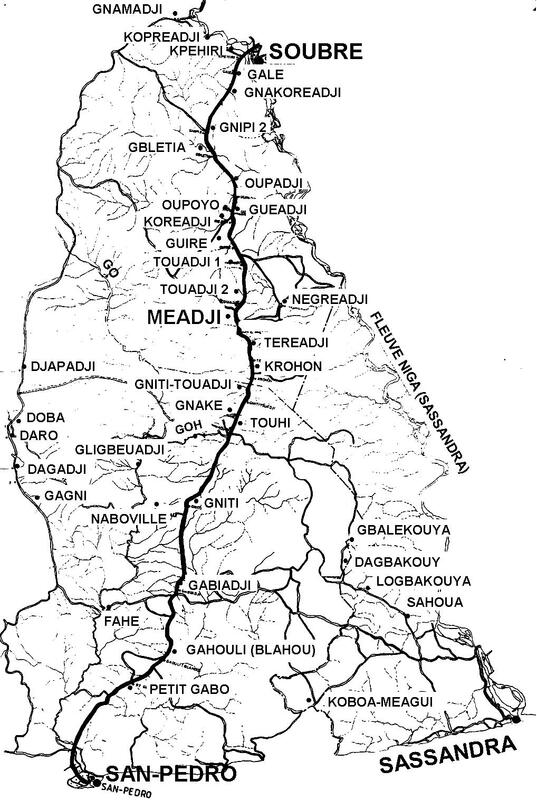 This map shows all the major Bakwé villages along with Soubré, San-Pédro, Sassandra, and Méadji (officially spelled Méagui)– the four major cities and towns in the area. The quality of this map is not the greatest, but you can click on it a couple of times to enlarge it. Eventually we will put a better map in its place. 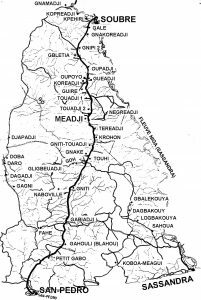 We work out of the village of Touadji II, the first village north of Méadji, in the center of the area. Click a letter to hear the pronunciation.